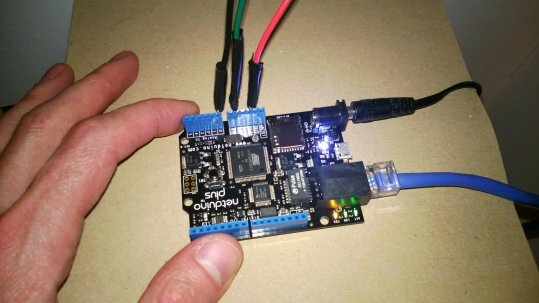 As mentioned in an earlier post, I’ve been working with the Netduino microprocessor board, a .NET version of the open source Arduino. In preparation for designing a home energy monitoring system, I created a small project to measure and post data from the Netduino. The simplest circuit I could find consisted of a photocell and a resistor wired into one of the analog inputs. Every 60 seconds, the Netduino measures the value from the photo cell and posts the data to the Cosm website where it is graphed and displayed for all to see. Data collection, analysis, and display are a particular interest of mine considering my background in SQL Server design and programming. Granted, this project produces a tiny amount of data, but it is a first step in integrating a microprocessor board with online graphing. One of the great features of Cosm is that you can set triggers for events to happen based on your data. 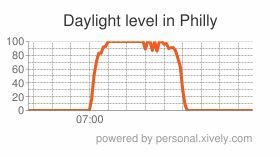 For instance, when the daylight value reaches 66% I could send a tweet announcing that it is daybreak in Philadelphia. Cosm also provides graph widgets for any public data stream on their site, such as the one below. UPDATE: In early 2018, Xively, the successor to Cosm, retired their free, personal IOT service. The image below is no longer a live clickable graph of daylight data but merely a static image of what used to be provided.